To understand the connections between law enforcement violence and reproductive justice, doctors and researchers have to think broadly about how history and policy affect care and barriers. When there is a police shooting, somewhere a doctor or medical staff are involved. They treat the living wounded, and as coroners, they read the bodies of the dead and produce autopsies that will be scrutinized by the public, the media, and the criminal justice system. Those documents underline that the provision of medical care is political. Physicians do not shed their biases and beliefs when they don white coats. Individual doctors and medical associations have been agents of social change and, in other cases, have fought hard to maintain the status quo or their own privilege; doctors campaigned to make abortion illegal in the late 19th century (largely in an effort to stigmatize midwifery, monopolize medical care, and control women’s bodies) while pre-Roe v. Wade “doctors of conscience” campaigned just as fervently to make it legal or available and safe despite the law. The American Medical Association long resisted granting physicians of color the rights to practice in majority-white hospitals, but physicians such as the late Dr. Paul Cornely also pushed integration of hospital staffs, articulated a vision of health as a human right, and documented health disparities. And the path a patient travels to a hospital or clinic is political too, as they navigate a minefield of structural but preventable obstacles including lack of insurance, racism within health care, and physical barriers such as poor public transportation. But, as three Bay Area physicians are pointing out, doctors and clinicians have roles to play regarding police violence that go beyond trauma care. Doctors Ashish Premkumar, Onouwem Nseyo, and Andrea Jackson recently co-wrote a commentary connecting police violence and reproductive justice in the journal Obstetrics and Gynecology. Their writing follows heightened awareness of law-enforcement brutality among health-care providers and public health workers. Researchers are slowly starting to address the knowledge gaps about stress, police contact, and reproductive health, with work such as the first known study about how anticipating negative police-youth encounters can affect pregnant Black women. In late 2016, the American Public Health Association (APHA) issued a call “for a public health strategy for preventing law enforcement violence that has four main elements: decriminalization; robust police accountability measures; increased investment in racial and economic equity policies; and community-based alternatives for addressing harms and preventing violence and crime.” It also recommended that health experts work with the government to track enforcement-related injuries or deaths, and that Congress fund research about the health consequences of police action. Premkumar and Nseyo, both OB-GYN residents at the University of California in San Francisco, spoke to Rewire about why they see police violence and surveillance as reproductive justice issues, the effect stress has on reproductive outcomes, and the moral and professional obligations they see for doctors and researchers to be advocates. Rewire: What drove you to write this commentary, and how common is work like this published in your field’s journals? Dr. Ashish Premkumar: I remember being in Chicago, visiting family in July, when I watched the video of the police shooting of Philando Castile in Minnesota and Alton Sterling in Louisiana. It was overwhelming to watch both videos back to back (both within a day of each other), and to be in the city where Laquan McDonald was shot 16 times not even two years prior. Beyond the horror of the violence, what struck me as well was the narrative provided by Castile’s girlfriend and the presence of her daughter in the back seat. I wasn’t the first one to come up with this concept, but I started thinking to myself: What does this type of violence mean to a family, to a community, and to women in general? SisterSong and other activist organizations have long been calling for this type of understanding through the concept of reproductive justice, but research has yet to catch up to activism. Indeed, in our own reproductive health journals, the issues around violence in the community are usually relegated to epidemiological studies, and most do not explicitly look at the relationship between law enforcement and reproductive health outcomes. Many of us in our residency program are involved with #WhiteCoats4BlackLives and #BlackLivesMatter, and I figured that by writing this commentary, it would be a great way to engage us both as physicians and as activists. Dr. Onouwem Nseyo: In my clinical training as an OB-GYN resident, my lens transformed from a learner to a health-care provider. During my intern year providing prenatal care at now Zuckerberg San Francisco General Hospital, I can distinctly remember being initially dismayed and disheartened by the real-life manifestations of the concepts I had so rigorously studied, such as the social determinants of health—women whose ability to interact with the health-care system, specifically for their own health and the health of their growing infant, was greatly impeded by a minefield of obstacles. How can you follow the nutritionist’s recommendation for your gestational diabetes diet if you live in a literal food desert? How can you help maintain appropriate weight gain in pregnancy if it is unsafe for you to walk in your neighborhood for fear of violence? How can you trust me as a health provider if the majority of power dynamics in your life have been imbalanced against you? My awareness of my patients’ struggles made every time they were able to participate in their care a true victory. Rewire: We know that stress and trauma can be deadly—and some say they can actually alter our very genes. If we take those ideas as givens, what could we reasonably expect to be the health effects of police brutality or intervention on the individual and community levels? Specifically, what does stress do to pregnant people and their babies? ON: Black women have consistently had the highest rates of preterm delivery in the United States, with data from the March of Dimes indicating a rate of 13.3 percent versus 9.1 percent among white women. Various speculations on the connection between police violence and reproductive health outcomes can be seen in the literature on racial and ethnic disparities in preterm birth. In one line of inquiry, researchers have noted a pattern of high levels of stress hormones in African-American women; in fact, these levels are so high that they are similar to the rates in patients suffering from post-traumatic stress disorder and other stress-related psychiatric conditions. Data also suggest that higher stress in the second trimester of pregnancy is associated with higher levels of cortisol, a stress-related hormone, and higher rates of babies being born too early. We can think of stress as a powerful force like the natural phenomenon of wind. If a tree is planted on a coastal cliff and constantly buffeted by wind, it won’t grow upright like another tree that is protected from those winds. Police violence is not limited to direct physical contact with an individual, but includes a philosophy of policing a given community. 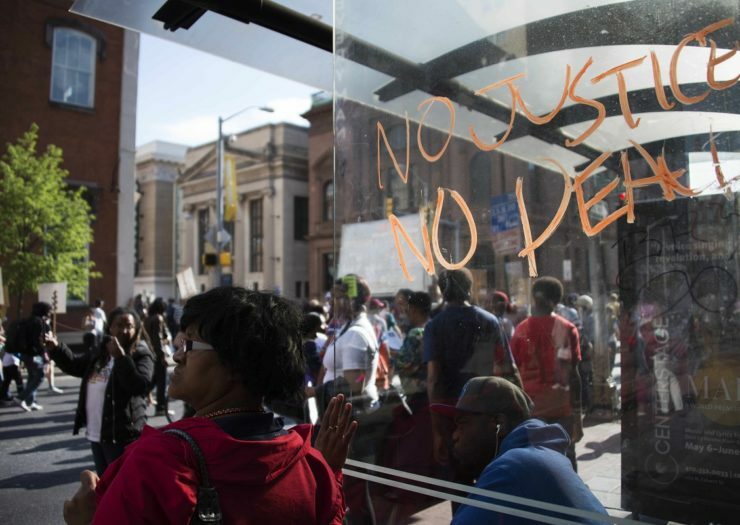 For example, the U.S. Justice Department’s investigation of the Baltimore Police Department noted highly discriminatory practices against Black Americans. Though making up 63 percent of the city’s population, Black Americans made up 86 percent of all people charged by the police department, with a high rate of dismissal of charges after arrest; the latter point suggests the use of arrest not as a means of prosecution of crime, but as a tactic of punishment in and of itself. Rewire: What questions should we be asking or issues should we be addressing regarding the reproductive health of those who are especially vulnerable to police violence, including Black Americans and other people of color, trans people, and people with mental health conditions? AP: I think the questions we need to be asking have to do not only with reproductive choice—Do I want to be pregnant or not? Do I want contraception or not?—but also long-term reproductive health outcomes (i.e. Pap smears, mammograms, continued surveillance of chronic medical conditions). For example, Lynn Yee and colleagues at Northwestern University in Chicago demonstrated a huge racial-ethnic divide, compounded by socioeconomic status, in whether women who have a history of preterm birth and are currently pregnant continue using progesterone, a drug we give to reduce rates of preterm delivery. Low-income, Black women had higher rates of discontinuation of the medication compared to others. A structural approach to finding out why could focus on issues around transportation and marginalization along racial and class lines in Chicago as an explanatory factor. We could look at the role of police brutality (particularly, the fear of harassment or being stopped), as a potential factor that may affect transportation and continuation of care. Put bluntly, people may be less likely to travel long distances to receive care because they fear being stopped or harassed by police. This type of analysis brings up crucial questions around policy and justice that could have a direct impact on the health of communities both in places like Chicago and across the country. Rewire: “Police-involved” fatalities should not be difficult to track, even if the reasons for them vary. But you make the point that it’s another thing to trace the effects of police violence on the living and their health. What can medical or other scholarship do to change that? AP: The concept that violent incidents ripple throughout a community and can cause important changes in the everyday lives of people is not new; anthropologists and sociologists like Veena Das, Nancy Scheper-Hughes, Arthur Kleinman, Paul Farmer, Philippe Bourgois, and Didier Fassin (just to name a few) have looked at these issues in the global and local context. Together, their research indicates that everything from economic policy to historical incidents that happened hundreds of years ago has a direct impact on how violence is enacted and suffering is experienced in the present. Biomedical scholarship is just taking up this mantle. By linking history, economics, and politics with the lived experiences of people, we can take a step forward in making the argument that the past [seeps] into the present in unique and unpredictable ways. And that requires a change in the way we think about health-care policy and practice. But the crucial step as a medical practitioner is to see how these issues structure health-care access, perceptions of health, and ultimately health outcomes. Infectious diseases, psychiatric illness, and chronic medical illness have usually been the forefront of these analyses; limited data exist in the realm of reproductive health to illustrate this relationship. I hope by making the connections between police violence and reproductive health outcomes, we can usher in a different way of thinking that can impact reproductive health policy from a historically grounded, critical perspective. Rewire: What responsibility do physicians and public-health researchers have to weigh in on social issues? AP: This has been one of my big focuses as a physician and a researcher. The role of physician advocacy—both its ethical underpinnings and requirements for a whole new way of thinking in biomedicine—is one that is near and dear to my heart. People have been writing about physician advocacy for the past 20 years, with voices both for and against the idea. However, I feel that if you are taking care of a community, it behooves you to understand why people are getting sick. The way it was put to me as a medical student was like this: You are standing at the edge of a river, and you see people floating down it without life jackets. They are calling out to you for help, yelling that someone keeps throwing them in just further upstream. Is it better for you to dive in and save people one by one, or should you go upstream and stop the person who is throwing people into the river in the first place? Rewire: You refer to the reproductive justice framework, which says that people have the right to choose if and when to parent and that they also have the right to live and raise families in safety. But at times, there’s a seemingly inexplicable gap between health-care providers—many of whom do subscribe to the idea that your environment influences your health—and activists who are pushing for a right to health and, yes, a right to life for Black people and others who are at risk for harmful police contact. What are the obstacles to physicians adopting a reproductive justice framework? ON: The overall direction of medical education, in my experience, is very pathology-based. Our goal in medical school is often to learn how to treat the diseases, rather than prevent them. Even within the concepts of preventive medicine that we do learn (for example, stopping smoking reduces the long-term risk of hypertension and heart disease), it is so rare to discuss prevention within the framework of patient safety, let alone in relation to reproductive potential. In fact, in some cases, traditional medical training not only departed from the reproductive justice framework but actually proactively worked against it. It’s well known that during the eugenics movement of the early 1900s to 1970s, more than 30 states had laws allowing for forced sterilization as a public health strategy that “could breed out undesirable defects from the populace.” And that couldn’t have happened without doctors and health-care providers. Rather than working to limit the reproductive potential of these women, the goal of the medical establishment should be to provide care and scholarly work that bolsters activists’ endeavors. We should also join them in our actions—a type of clinical activism that requires us to be not only aware, but galvanized by the violence that devastates marginalized communities.